Forest of Dean Wildlife & Nature Diary: Red Deer Rut! I dragged myself out of bed nice and early this morning to go in search of a beast, which has eluded me for quite some time. The Red Deer. I desperately wanted a stag silhouetted against this sky, but if they ain't there then there isn't a lot you can do about it. After around 30min of walking up and down hills with a very heavy kit bag on my back I was starting to wonder if there were any in the area at all! 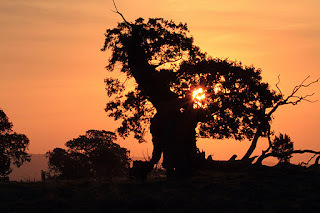 As I approached the top of the last hill I could hear the familiar sound of red stags as they bellowed and finally I spotted them in the distance. To be honest I didn't think I had a chance of getting near enough to grab a decent photo as they were so far away and in the open. However, like all wildlife, if you can't get to it then you have to wait for it to come to you. I scanned the area and saw what looked like the ideal spot. However, it meant I would have to walk into the open to get to it, in clear view of the rutting deer! It was a nice spot behind a fallen dead tree and it looked to good an opportunity to miss, so I went for it. They spotted me as I got to the tree and they stared right at me, but I was far enough away to not disturb them and they soon went on with their business, paying me no attention. Now, in a better location and hidden behind the tree I was confident they would eventually come closer, and they did. 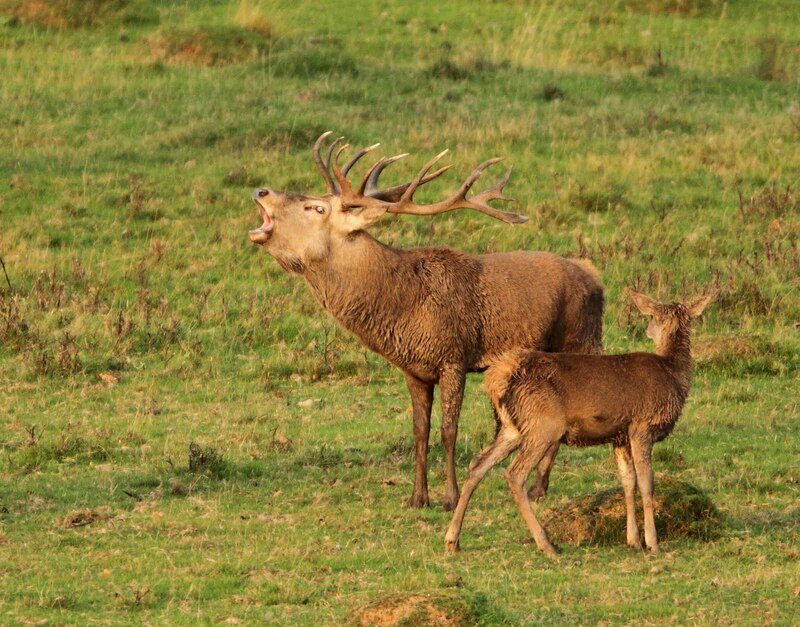 This fella was bellowing the loudest and judging by the size of his antlers, there wasn't another stag in the area to match him! 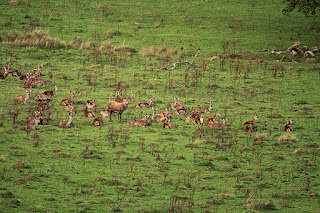 Watching this group, I saw two hinds start to square up to one another so I trained my camera on them just in case something happened. 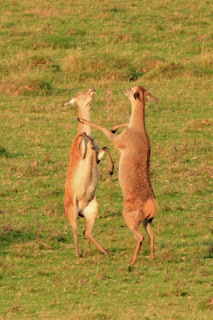 I was gobsmacked to see them rear up on their hind legs and box each other; just like hares! Then I heard it; the clashing of antlers! I was on them like a shot, but they had separated! 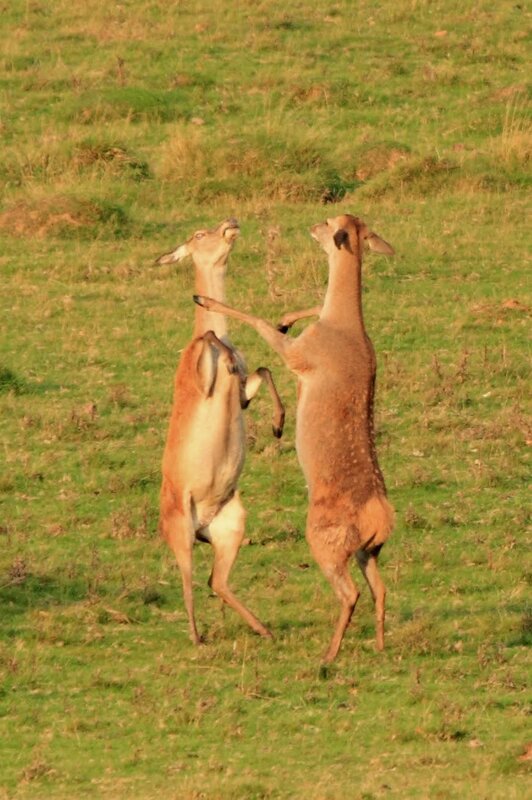 They were two younger stags and were still squaring up so I stayed with them. Suddenly one turned to face the other and as soon as he did the other instinctively turned also. 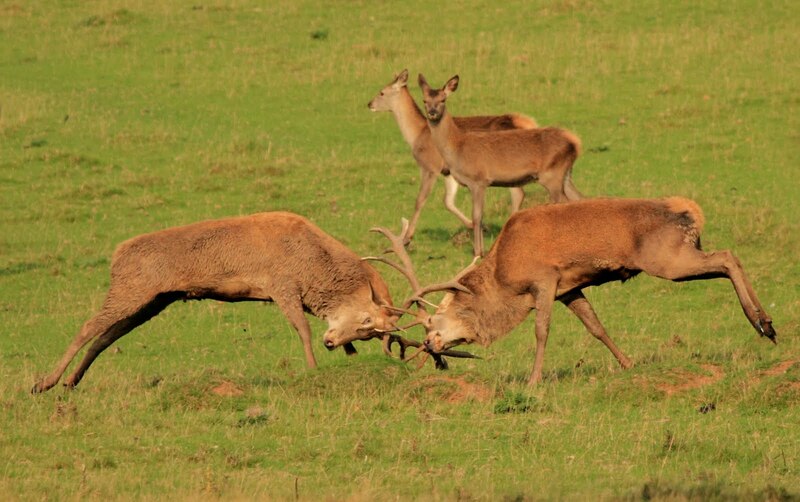 This photograph was taken at the precise moment of impact and you can see the one stag has both his hind legs off the ground as they smashed together! I photographed this herd for a while and then decided to have a look around to see what else was about. 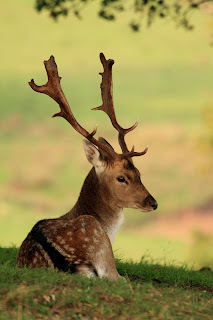 It wasn't long before I bumped into some fallow bucks resting, so I took the opportunity to grab a few shots of them. I saw a nice group of scotch pines and decided that it would make a great photograph if I could find a deer in there, so I ventured in! 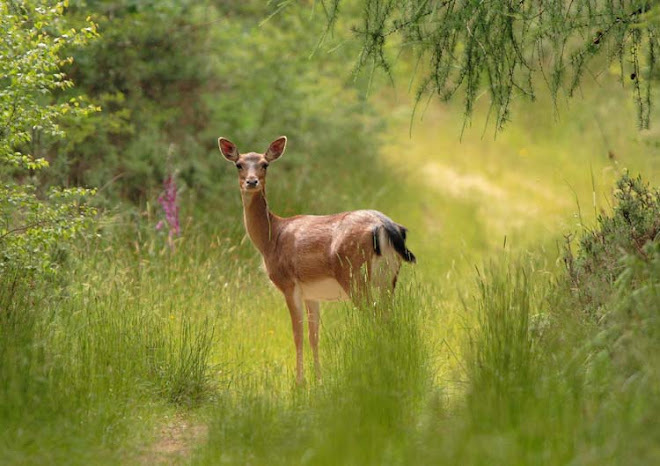 I had only walked around 5 metres when I heard a fallow roar nearby, so I took my heavy bag off my back and sat down by a tree to rest and hope that he was heading my way. 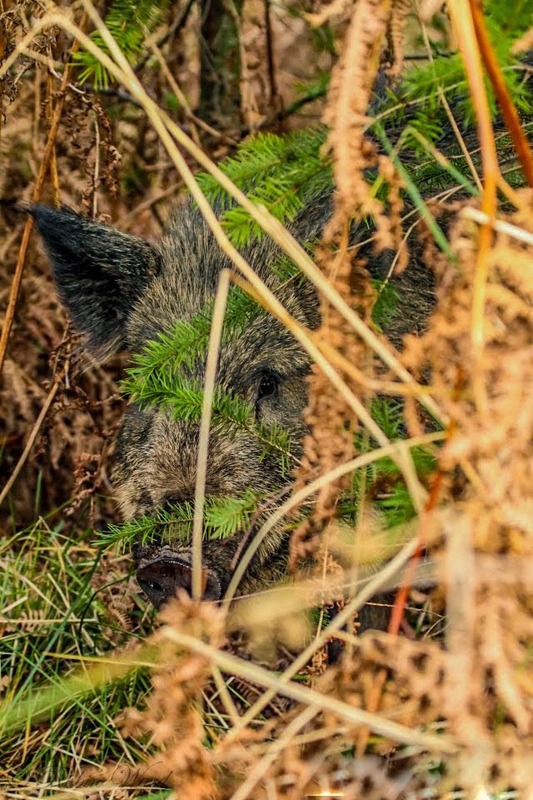 I was scanning the area to my right, in the direction of the fallow when I heard a noise behind me. I turned my head to find the biggest deer I have ever seen, on the edge of the woodland I had just entered! He was the size of a cow and had some pretty impressive antlers. 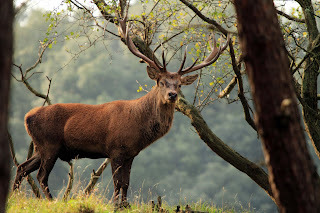 I must admit, being this close to a massive red stag during the rut was something else, but I also knew I was on his patch so I had to be careful. I tried to get into a better position and this is when he bellowed as loud as he could. Believe me, it was loud. I took a couple of snaps (out of position) and then just lay there admiring him until he vanished down the hill back into the valley. 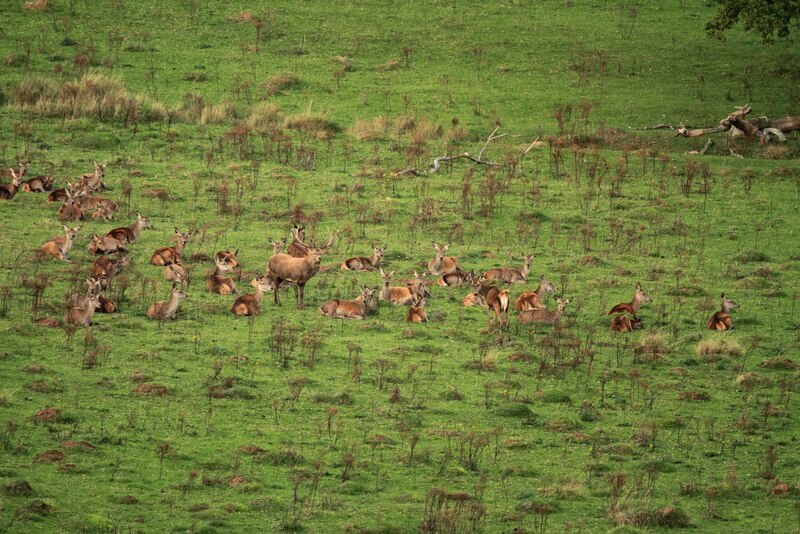 I was now fueled with adrenaline and with the red deer lying down resting, I knew this encounter was at an end. PLEASE DO NOT APPROACH DEER DURING THE RUTTING SEASON, THEY ARE EXTREMELY DANGEROUS ANIMALS AT THIS TIME OF THE YEAR. SERIOUS INCIDENTS CAN AND SOMETIMES DO OCCUR INVOLVING HUMANS AND IT WILL NEVER BE THE ANIMALS FAULT. IF I AM EVER INJURED I WILL NEVER BLAME THE ANIMAL INVOLVED, NO MATTER HOW SERIOUSLY I AM HURT. MY FAMILY ALSO KNOW AND RESPECT THIS. All sorted this time.......a great post. 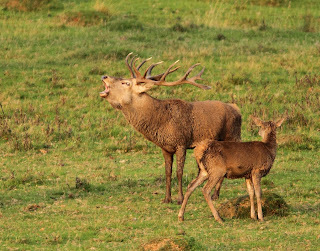 Lovely pictures, particularly the unusual one of the hinds squaring up. 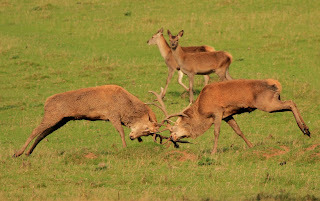 Visited my local deer park this past week, but couldn't see any signs of rutting behaviour! 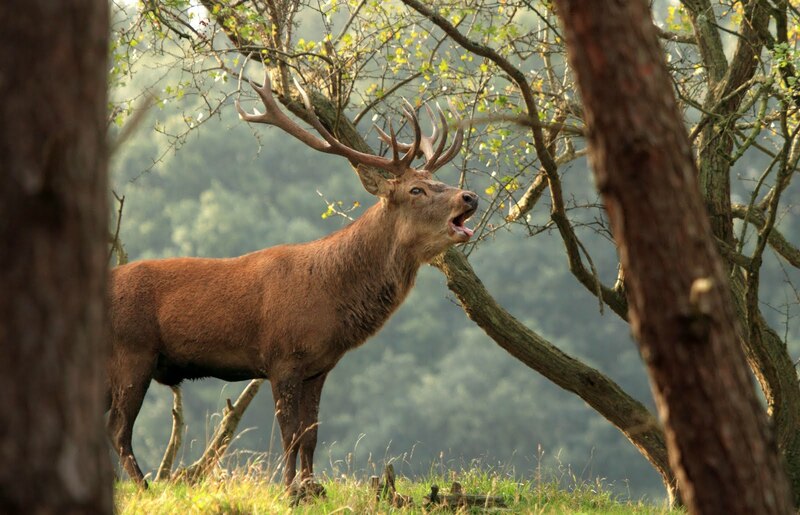 I am excited to hear about Red Deer being in the Forest of Dean - I didn't think we had any here! Wow. ARe you able to tell us a little more about them? As in, numbers of them and where they like to hang out? Not in Forest of Dean I'm afraid, but they are in Gloucestershire on a private estate!